Datum is a decentralised storage networked backed by DAT (Data Access Token). 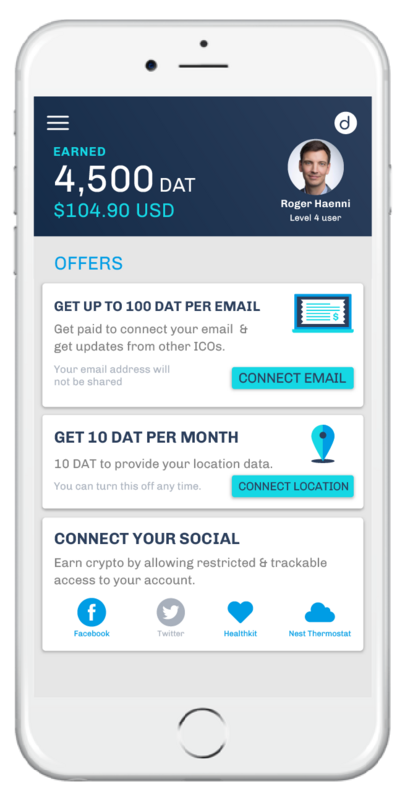 With Dat app you can choose to sell your data anonymously to earn DAT tokens. With your permission datum will anonymously sell your data for money. Well there have been many news of your data being leaked on the internet. Currently there you will see two tasks. Enabling email receiving and tracking your location that advertisers will use to display targeted ads. But be sure that your data will not be leaked to anyone. Go to this link to learn more about DATUM. Go to the link above, download the Datum app, register an account and start earning. This is the best platform to sell your data anonymously and earn some DAT tokens and exchange for fiat. Congratulations! This post has been upvoted from the communal account, @minnowsupport, by neupanedipen from the Minnow Support Project. It's a witness project run by aggroed, ausbitbank, teamsteem, someguy123, neoxian, followbtcnews, and netuoso. The goal is to help Steemit grow by supporting Minnows. Please find us at the Peace, Abundance, and Liberty Network (PALnet) Discord Channel. It's a completely public and open space to all members of the Steemit community who voluntarily choose to be there.